It is constantly said by clients that my fees are most competitive – the industry standard can be found at link. Fantastic Solicitor and Notary, fast, efficient, and reliable service. Very conveniently designed online booking system. Cannot speak highly enough of the service I received. Absolute quality and ethical work. After hours and weekend service is very convenient. Online Appointment booking makes everything more easy. Very Excellent service. I have never seen any solicitor having such dedication towards work and friendliness towards clients.I definitely recommend Mr.John to each and everyone . Excellent service. Very professional and techsavvy. And great convenience due to after hours availability for those busy during the day. Would recommend to anyone and will personally use again in future. Fast, efficient and friendly service. I particularly liked the online booking system that ensured I was able to get a quick appointment for Notary services. Highly recommended. Excellent Service, can't beat this! John is very efficient and every cent you pay is worth his efforts and experience. I will go back and recommend all my contacts who need a 5 star service to John. My first surprise was the ease of finding a notary public in Melbourne, which I did via the web site for John Pearce. The second surprise was that the actual notarization was done quickly, efficiently and in a professional manner. The addition of friendliness on top of this was the third surprise. I have made my documents to be notarized twice. Mr. John Pearce gave me kind and great service of notarizing. Thank you very much. Thank you for your kind, earnest and honest service. Your professional notarizing gives me a great help and conveniences. Mr. Pearce was very professional and provided valuable information about our notary to be completed and a future notary. We will have several documents from the USA for which Mr. Pearce will take care of our needs. Highly recommend his services. Great service. Having Notary services available after hours and an online booking facility is super helpful. My documents were notarised in under 10 mins, and I didn't need to wait any longer than required. Amazing man. Making an appointment was easy. Took care of me as a student. I would never go see someone different in Melbourne. Thanks again for the notary!!! John is very friendly, understanding and efficient. I went to him during after hours for notarial services and am very satisfied. Extremely easy to work with and I highly recommend his service. I was looking for a Notary Public to certified some documents urgently and at the same time, I have a busy week at work. Hence, I have been searching online and asking around, hoping to get this done as soon as possible, and preferably after hours. I found John Pearce!The after hours (my appointment was at 8.45pm on the same day I book) which is perfect for my schedule, and I am able to book the appointment online. How convenient! The fee is very reasonable, and on top of all, it was a very professional and yet friendly approached. Overall, it was a great experience and highly recommended. John and his team was very professional and friendly at the same time. He completed the Power of Attorney within 10 minutes and the cost was also very reasonable. It was my first Notary experience in Melbourne and he made look very easy. Moreover he was very knowledgeable about the overseas POA documents and notarised the document better than i was expecting it to be. I would highly recommend anyone using his notary services. I wish I could give 50 stars instead of 5 !. John is excellent and he together with his team is amazing . I went in with a lot of confusion and quite a lot of documents (I do mean a lot) . He was so patient through out the whole process. Helped me sort things out. He is so friendly and understanding , if I ever need something related to legal in future John Pearce is the person whom I would go to without second thoughts . I had urgent overseas POA documents that I required urgent help in relation to formalities and as this was my first Notary experience in Melbourne, I decided to search online for a reputable Solicitor and Notary Public. The highly recommended reviews, the services that he offers along with being able to choose your preferred location definitely helped in me making a decision to go to him. The huge advantage with him are the hours of service he provides, be it during work hours, after hours - even on weekends with no extra charge. His easy to use quick online booking system helps you choose a day and time suited for you. I had booked on a Sunday and had met him in his city office location where the receptionist of the building was not there. I called Mr.Pearce to let him know I had arrived, and he was a real gentleman coming all the way down to let me in the building and take me up to his office. He was very knowledgeable about the overseas POA documents and explained things very clearly. I didn't feel rushed and he completed my POA within 15 minutes. I found his fees to be very reasonable - you can see them even on his website which helps gives you a rough idea. He was efficient and professional in handling my notary requirements along side being very helpful and polite at the same time. I highly recommend him for his services. You will not be disappointed!Oh and I love all the different trinkets, souvenirs he has collected over his travels abroad in his city office - definitely shows he's true gentleman at heart.Apologies I could not write a shorter review - but clearly you can see why! I went to John Pearce yesterday to get some documents notarised, and the process could not be easier! John's website has plenty of information in easy, lay-man's language that explains how notarisation works. From there, it was really easy to book an appointment online. Having done the notarisations, John followed up with me personally via a text message regarding an issue. He is a thorough professional and it was a pleasure dealing with him. I highly recommend him if you need to get your documents notarised. Keep up the good work, John! Cheers! Very professional and prompt. Convenient hour to be open for documents to be signed. Has a lovely manner, was pleasant to talk to and is very knowledgable. Also down to earth and personable. Even though we went overtime, he did not charge for that but rather a good and fair price.Highly highly recommend John Pearce. He's legend! 5 stars are too little to express my gratitude for the notary service from John. I was supposed to spend much time and money by notarise my documents because they are complicated and quite urgent. It was amazing efficiently that John got everything done in 15 minutes and the fee was really reasonable. By the way John is professional and knowledgeable at notary policies between different documents and countries. By his valuable suggestion I completed my following notary quickly and smoothly and saved my time cost. Moreover John is very friendly and easygoing. If you need notary service please don't hesitate to make a appointment with John. You won't regret it, trust me. I got an appointment just 4 hours before the actual appointment time through their website today. I got there and John approached me. He was very friendly and accommodating. I thought preparing POA is a very tedious job but he made it so nice and easy. He was very professional and the quality of service is excellent. His charges are also very reasonable. Thank you very much for your help John!! Will be recommending to all my friends and family..!! Cheers!! I have been to John Pearce 3 times to get documents notarised for an overseas matter. He’s really efficient and the price is considerably cheap. It’s also so easy to get an appointment with short notice, and the online booking system is amazing. Definitely recommended to anybody who needs documents notarised. A Notary Public can certify that copies of documents are authentic, especially if the certified copies are to be produced overseas. A Notary Public can witness signatures on documents, including Powers of Attorney, which are for production in another country. A Notary Public can certify that documents are authentic originals. Why Would You Need a Notary Public? A Notary Public is a person recognised by law as having the ability to verify signatures and authenticate documents for production overseas. A Notary holds a unique office of trust and fidelity within the legal system. A Notary Public uses an official stamp and Notarial Seal which are placed on official documents. 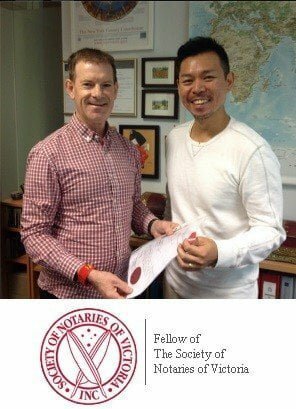 The Australian Department of Foreign Affairs and Trade (DFAT) retains a copy of a Notary’s Seal and Signature so that, where applicable for a particular country, DFAT can provide an Authentication Certificate or Apostille Certificate as to the authenticity of the Notary’s Signature and Official Seal. John Pearce is a Notary Public available at short notice by appointment during Business and After Hours including Weekends in the Melbourne CBD Office and in the Eastern Suburbs Home Office. John Pearce provides notarial services that are appreciated by his thousands of past clients, as is evident in testimonials. His care and concern for every client ensures the process of notarising documents is simple and convenient. A mobile service is available in the Melbourne CBD. You can book an appointment instantly online via the Blue Boxes or by calling 03 8648 6541 during Business Hours or calling/texting 0419 383 397 any time. If you are in need of notarial services within the Melbourne Central Business District (CBD) or the Eastern Suburbs (Box Hill South), we can provide you with personal service by appointment. The Melbourne Office is close to Melbourne Central, Collins Street, trams in Bourke Street and buses in Lonsdale Street. From the Melbourne CBD, the Box Hill South Home Office is a straightforward, convenient and pleasant drive along the Eastern Freeway to Elgar Road, turning right into Elgar Road, then a few kilometres down to Riversdale Road, then turning left at Riversdale Road for less than a kilometre, and finally turning right into Frank Street, Box Hill South – fourth house on the right to the Home Office of John Pearce Solicitor & Notary Public. Press the bell at the Right Hand Side Steps and proceed to rear of the residence.